This entry was posted in Uncategorized on May 27, 2018 by timcoppard. 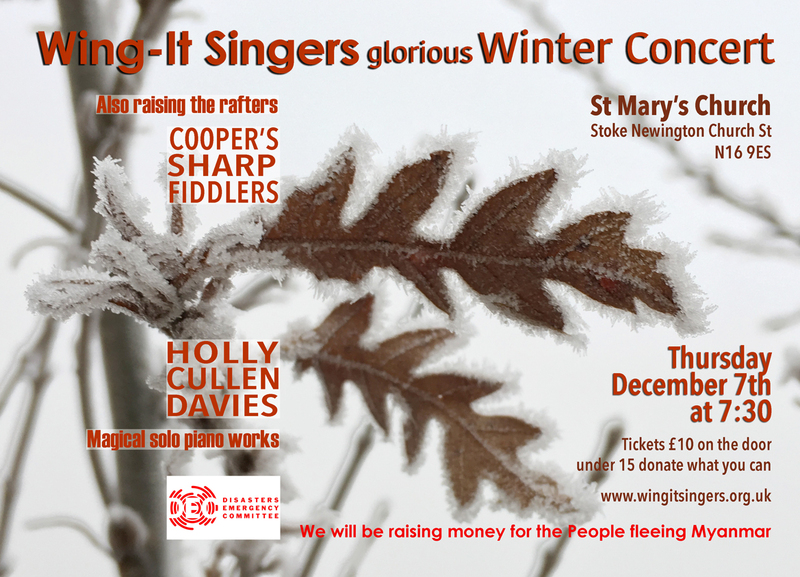 We will be joined by the brilliant Cooper’s Sharp Fiddlers and the always wonderful piano playing of Holly Cullen Davies….. This entry was posted in Uncategorized on November 19, 2017 by timcoppard. 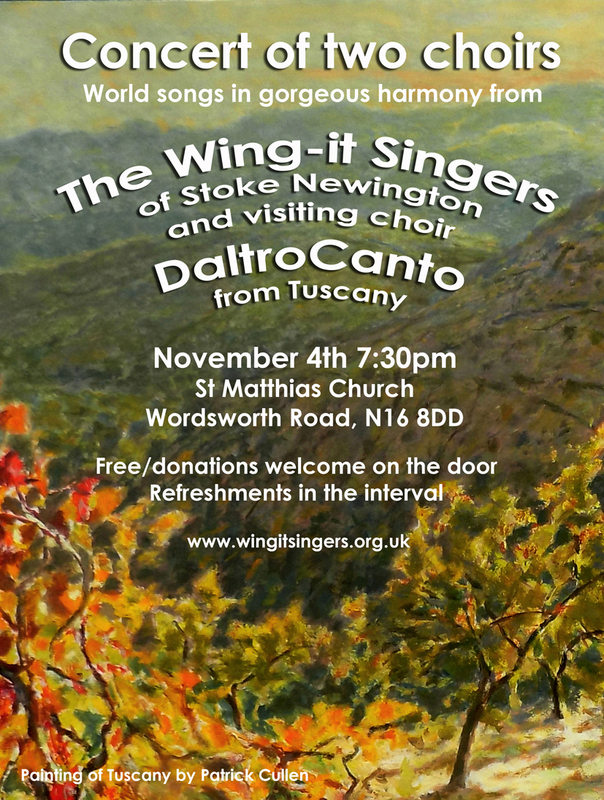 For our forthcoming concert, the Wing-Its are delighted to be singing alongside D’Altro Canto, our visiting choir from Tuscany! Free entry/donations on the door; refreshments at the interval. This entry was posted in Uncategorized on October 25, 2017 by timcoppard. 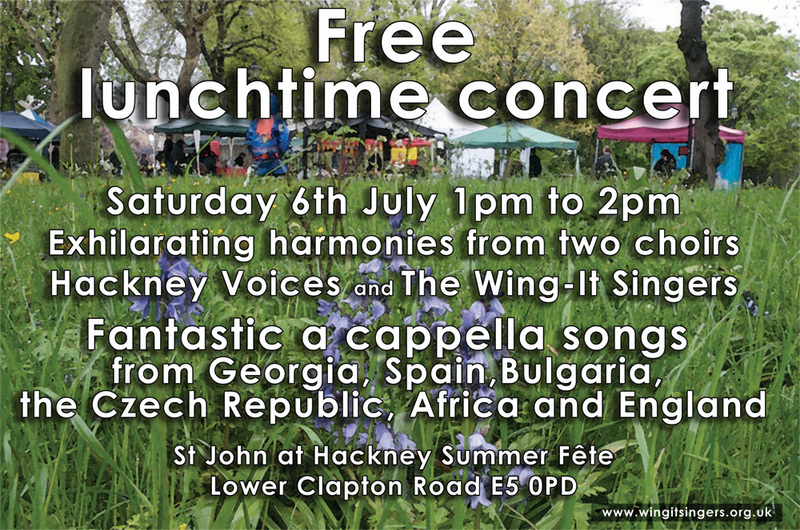 The Wing-It Singers will be joining another choir, Hackney Voices, on Saturday 6th July 2013. As part of the St John at Hackney church fête, we will be performing at a free lunchtime concert from 1-2pm. Expect some exhilarating harmonies as we sing a cappella songs from Georgia, Spain, Bulgaria, the Czech Republic, the African continent… and England! This entry was posted in Uncategorized and tagged a cappella, Africa, Bulgaria, choir, church, concer, concert, Czech Republic, free, free lunchtime concert, geogria, Georgia, hackney, Hackney Voices, harmonies, lunchtime, music, singing, Spain, summer, Wing-It Siingers on June 27, 2013 by wingit01.